Ok. So I started testing IE8 and was pleased with all of the new features (visible to the end user). I also saw that it rendered pages much quicker and the IE7 browser and even faster than Firefox for the pages I tested (feel free to ask which ones). Then, it hit me. I decided that Firefox 3.1 is much more customizable and works better than IE on many many sites so I switched. I have the same features (webchunks insteak of webslices, auto complete, etc) and don't have as many compatibility issues. And I was happy with it. Long story short, I ceased my IE8 testing at this point. I'm playing the field a bit more before I decide on a favorite browser. 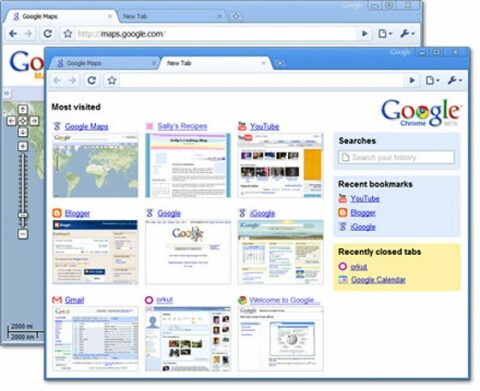 Two things I like about Chrome without having even seen it yet: 1) they've chosen to improve existing technologies for the most part, rather than launch yet another browser platform; 2) they've attempted to re-imagine the interface based on how people use their browsers today. The results should be very interesting and will hopefully lead to improvements in the other browsers.